Yesterday, I posted the first of a few reflections on the collaboration and thinking, and making, that went into the building of the online NetNarr Alchemy Lab of Digital Objects. This post is the follow-up, with more reflections on things that seemed to work and things didn’t seem to work (as well as I would have liked). One more post tomorrow will look at potential next steps and following up with the Alchemy Lab experience. Visit the NetNarr Alchemy Lab to see what has emerged. Where it worked: Early on, we had a vision of an immersive virtual lab that visitors could wander around in, like a museum. None of us had done much with immersive media, but it was Wendy who found and then suggested we try out the new ThingLink 360 platform. 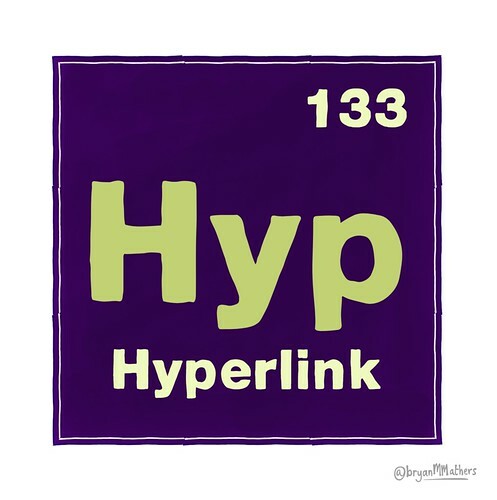 Many of us have used ThingLink before — it allows you to layer information and links and media on top of an image — so this seemed like a good fit. Mostly, it was. Susan created the artwork of the lab — I am still in awe of what she did and how quickly she did it — and Niall was able to stitch the images together into a useable 360 degree image that ThingLink accepted. The immersive lab means that you wander around the lab, as you zoom in and out, and it works on browsers, and on mobile devices, and with VR devices like Google Cardboard. 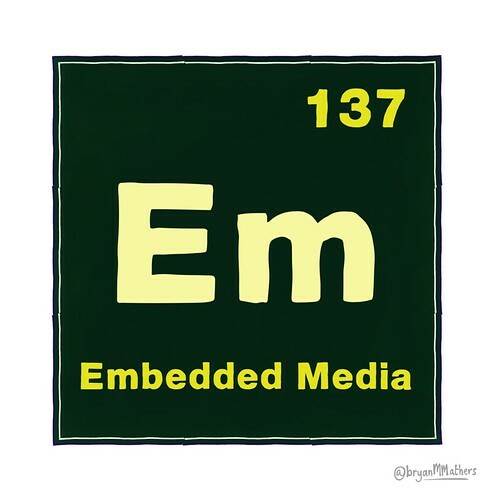 Some of the embedded media works better than others. Where it didn’t work (and what we did): One thing I noticed early on as I moved individual media projects into the Lab is that things got rather crowded with the layered icons from ThingLink. Also, some media objects I could upload directly, and they worked fine, and some I had to host elsewhere, and embed, and some I had to create a portal that moves the user from the Lab to the site outside the Lab, which was not ideal. We also find that some of the media that works fine in one platform (like a mobile device) doesn’t always work so great in another platform (like a browser). I’m not sure of a solution to this problem, so we sort of accepted it as a condition of our construction. On a technical side, for some reason, my Chrome browser won’t play ThingLink 360 (but I am certain is something on my end … perhaps my video card is too old). It works great in Firefox and on mobile. Where it worked: This project began with a group of open participants in the NetNarr ecosystem, but soon spread to folks in the DS106 and CLMOOC communities, and beyond. We shared various invitations widely at the start, hoping to get more people involved. We really wanted a slew of students in the NetNarr classes to come in with us — to bridge the network of the narrative — and sent out personal invitations on Twitter to them. These are those who made art for the lab: Niall B, Todd C, Charlene D, Sheri E, Simon E, Roj F, Terry G, Kelli H, Kevin H, Sarah H, John J, Alan L, Keegan L, Algot R, Ron S, Wendy T, Clare T, Susan W and Lauren Z. That’s nearly 20 people involved in making digital art. Pretty nifty. Where it didn’t work (and what we did): We didn’t get many NetNarr university students, which points to how busy they are in their learning lives at the university, or maybe some wariness of invitations from folks they only know through Twitter hashtags, or something else. It still seems like open NetNarr folks are on the outside, looking in, as opposed to being part of the fabric of NetNarr. I am not blaming Mia or Alan, because it makes me wonder how courses can tap into the open community more, and in meaningful ways. Where it worked: This whole project could not have been done without a handful of folks behind the scenes: Wendy, Sarah, Todd, Susan, and others. We had an open Twitter DM Chatline going nearly constantly through six weeks or so, and we also did two different Google Hangouts (on the same day) because of time zone differences. I am in the US. Wendy is in Australia. Sarah is in Scotland. It all made the organization of things easier (so many of us) and difficult (communication unfolded over time zones). We self-assigned the work, I realize, with me building the Lab in ThingLink, and Wendy keeping the invitations and table of objects organized, and Sarah providing technical support (sometimes, with help of Niall) and as a sounding board. Todd gave us encouragement and ideas, and Susan gave her art and spirit. Where it didn’t work (and what we did): There was no hurdle that we didn’t overcome. This may come from mostly knowing each other over the years through other collaborations, and it points to the value of developing creative relationships over time. So, what now? Please enjoy the Alchemy Lab, and maybe add some art when you get to the Exit point (you can leave the lab by looking up at the ceiling). The collaboration and making of media doesn’t have to end with the Lab. Bring your alchemy out into the world! And who knows … another collaborative project is always right around the corner. This all began when I had a crazy, inspired thought that I decided not to keep to myself (because how much fun would that be? ): What if the (open and university) folks dabbling in Networked Narratives together created a collaborative piece of transmedia artwork together? I had recently been thinking more about transmedia storytelling — about how to try to tell a story that unfolds across different digital media and mediums, each piece with the ability to stand alone and yet each piece also part of the larger story. A course I took via FutureLearn gave me some ideas, and I have tinkered with the concept before with the now-defunct Digital Writing Month. I pitched the idea out to create an Alchemy Lab space filled with objects that could be used to inspire stories, and some of my friends — Wendy and Sarah and Todd and Susan and Niall, and others — bit. Phew. This did not seem like something one could go into alone, so I was quite happy to have partners. Ok. So, could we actually pull this off? We did, sort of, although not quite like the original vision. 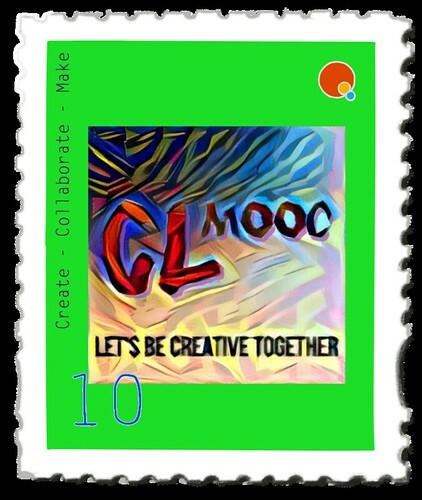 We centered on the term of “Mediajumping” in the early stages of our invitations to folks to collaborate. Some background: Networked Narratives is a university course being taught in the US by Alan Levine and in Norway by Mia Zamora, and the NetNarr course has an open participation element to it, which I am part of. This is the second iteration of Networked Narratives. This post is part of a series of reflections on the last six to eight weeks of work behind the scenes as we wrangled a vision of collaborative digital art and storytelling into reality. It’s also an attempt to remember what we did, and workarounds we had to find, to make the Alchemy Lab exist. Where it worked: The original idea is that a virtual lab would become a source of a larger story — the Narrative of the Network — to be told by many people, with many different media. Originally, I wondered if we could “hand off” the story, in chapters, to the next participant in line. 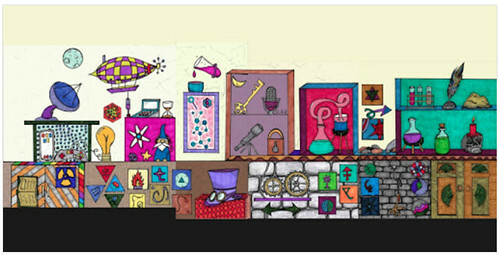 We have done this concept in CLMOOC with projects such as The Search for ChalkBoard Man and the DigiWriMo StoryJumpers project. Sometimes, it works. Sometimes, it doesn’t work because the common narrative threads get lost as the story moves. Sarah, in particular, really wanted something more logical, more story-centered. The use of the term “Mediajumping” in our early invititations allowed for an open invitation for folks to create with the tools they had available, and to follow their interests. Where it didn’t work (and what we did): I don’t think we figured this out, for the “story” that emerged was more of the Lab as the anchor point for media. We decided to allow people to choose items from the lab and build media and stories around the items. The overarching narrative is that you have found a hidden lab. I pondered if we could leave clues, like easter eggs, in our media that would point a larger story. The scope and scale was too difficult to pull that off. 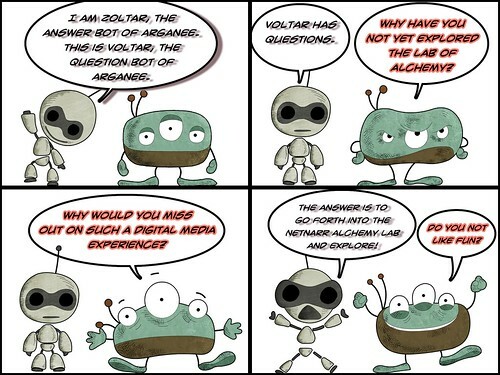 In the end, we let it go as a media-oriented lab experience, and hoped that smaller pieces of stories might emerge. Some did. Some did not. Will someone take the smaller pieces and stitch together something larger? I don’t know. Where it worked: Susan’s artwork of the lab (which Niall stitched into a 360 image) was stunningly beautiful, and inspirational. We knew we would have to find a means to disperse the story and the objects, so we created an collaborative document with a table, and asked folks who had signed up (via a Google Form, via an interactive story invitation in Twine) to choose an object and create. I had hoped for a wide variety of media. There were 46 items made. Where it didn’t work (and what we did): We have a lot of GIFs in the lab, and we celebrated whenever someone added something different — like a time-lapse video poem or an interactive website. If this were our full time jobs, we would no doubt have had more variety, and I am happy with what folks made and shared. I found myself penned in a bit from time to time with how to make media, and tell a story, all with a single object as inspiration. But our unofficial tagline of “every object tells a story” still seems inspirational. I think the idea of telling a story through small media pieces like gifs and images is something we grapple with. I’ll share some more reflections tomorrow in a second post, in which I look at topics of platform, participants and collaboration. For the past two months or so, a group of us open participants in the Networked Narratives have been working behind the scenes on the construction of an immersive, virtual Alchemy Laboratory of Stories. (Officially, NetNarr is a university course being taught in the US by Alan Levine, and in Norway by Mia Zamora, with some intersections with Maha Bali in Egypt, and with open doors to the open learning community — that’s where I am). 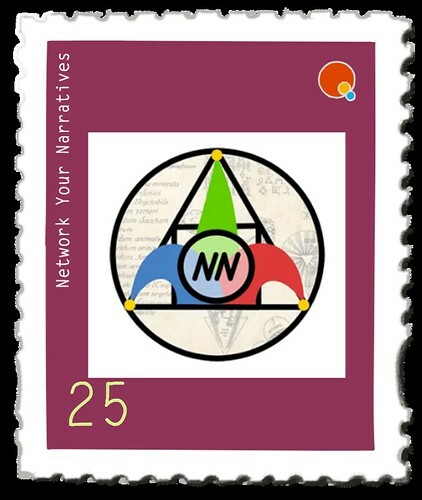 Many folks in various online communities (including CLMOOC and DS106, and some NetNarr students) have contributed time and resources, and media projects, that are now part of the NetNarr Alchemy Lab experience. 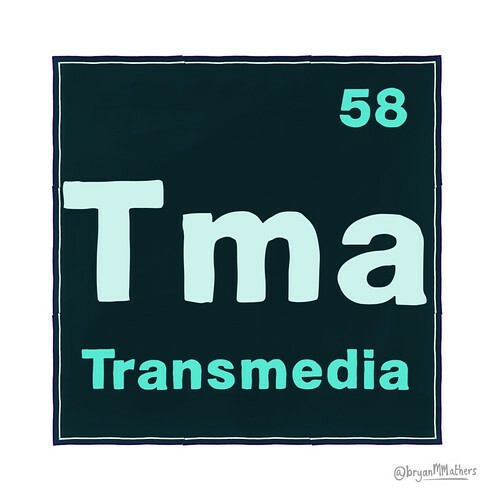 In fact, there are nearly 50 media objects created by nearly 20 people in this Alchemy Lab project. I’ll reflect in writing more about the experience another day, but for now, I want to invite you to come tour the lab we built through open invitations to create stories in a networked way. You can view the Alchemy Lab in a browser, or on mobile devices, or with Google Cardboard devices. 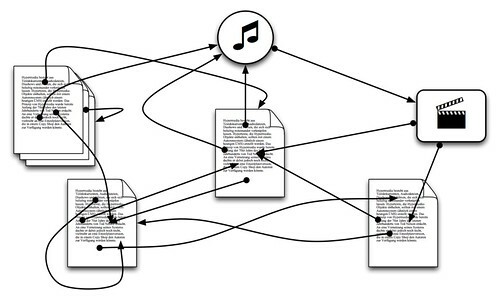 Layered links will either surface media projects or will give you a link forward to projects. The exit (on the ceiling) will bring you to yet another place where we invite you to make some digital art and share it, too. PS — special props to Wendy and Sarah and Todd for coordination and planning, and to Susan for her wonderful artwork, and to Niall for his technical prowess and advice. I could not attend the online Google hangout the other day for Networked Narratives, which featured guests Amy Burvall and Michael Branson Smith on the art of the animated gif, and the possibility for expression with the social media photo formatting. My friend, Wendy, suggested on Twitter that we make gifs from the hangout video, and well, that sounded like a fine idea. I did all of this within Giphy itself, which has stickers (which I keep forgetting about) and a drawing tool (ditto). And then I went a little nutty. First, I found a neat shot of the Alan, Amy and Michael, and added … a few special guests to the hangout. Then, I grabbed video of a gif art project and made it further into art with some gif doodling. Over at Networked Narratives, the theme is now shifted into GIFs, and all the wacky things you can do with them. Alan’s assignment calls for a GIF storm of sorts in the #NetNarr hashtag, including GIFs that connect with the Digital Life underpinning and finding narrative points in the clip from the Western movie The Big Country to pull out as animated moments. First, I went in to the clip and found the dramatic scene where the rider and horse are trotting away (later, the men will join the solo rider in a dramatic turn-around.) I use the Gif It add on for Chrome Browser, in case you are curious. The function gets built right into YouTube video viewer. Easy peasy. Then, I went into Frinkiac, a GIF generator of Simpson’s clips and found a Karaoke scene, so I layered in dialogue from the same clip I Gif-ed earlier, but made it into a sing-along song. Finally, I was watching the latest Courtney Barnett song, which is all about trolling people on the Internet, and grabbed a clip to Gif. The video is cool and strange and weird, so the Gif is, too. Finally, this morning, a student in the NetNarr Universe had shared some time-lapse movie making, and I grabbed a gif out of Roj’s work, just to see what might happen when a time-lapse becomes a gif. It’s interesting. Thanks to some sharing of an article by Wendy in Networked Narratives a few weeks ago, I stumbled on this 1990 film about where hypertext might be going, with novelist Douglas Adams. In a time when so many of us bemoan a seemingly apparent decline in writing and reading in young people, this video reminds us that maybe we are looking and observing in all the wrong places. Check it out. Candice Faktor shows us where and how young people are engaged in stories and fiction. This is part of a cool video series I found that dovetails nicely with my thinking of how to use technology to transform writing and literacies. I’ll sharing out other videos in the coming days, too. 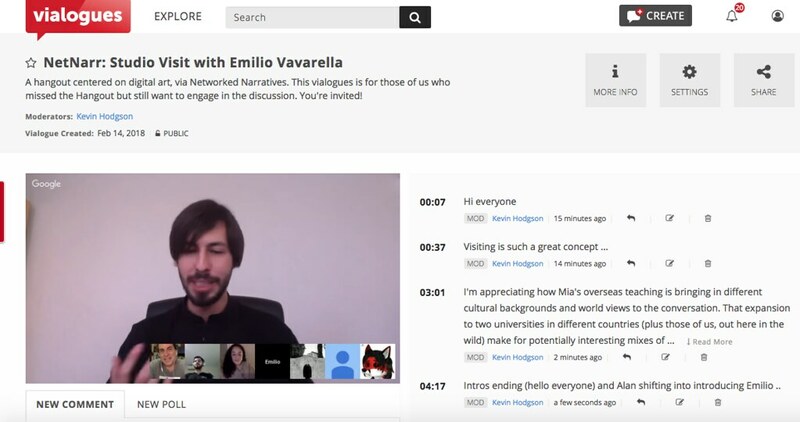 A Networked Narratives hangout last week with digital artist Emilio Vavarella provided some keen insights into how an artist might use digital tools and technology to make statements on the connected world. I popped the video of the interview into Vialogues so I could watch at my leisure and add comments/ questions/ observations as I went along. I invite you to join me in the margins of the video. 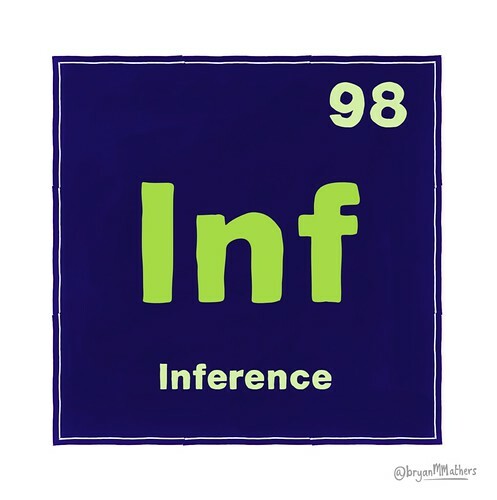 I saw Alan Levine sharing out an element he made the other week in a tool created by Bryan Matthers, at his Visual Thinkery site, and I decided it might be fun to give it a try. Bryan’s tool is pretty simple to use, and yet, the visual design is appealing. I made four elements, all connected to the concept of digital writing. And he encourages folks to play with making. And now he has just added a tool for making visual stamps. I had to try it out.